My friend, Paula and I went to the zoo yesterday on residents free day so that I could introduce her to Wilbur. Unfortunately he was not there but was in the SF Zoo Mobile entertaining school children around San Francisco. I went back today, Thursday in order to buy a membership to the zoo so that I could visit him whenever I want. Every time I have seen him, he is always sleeping in his barn but today I was thrilled to see him outside playing, taking a bath and hanging out for his fans - and he has many. I found out a few new facts about him. He is a picky eater and will only eat black mice. He is also bothered by the beeping sounds that the zoo trucks make when they are backing up. He is a homebody and loves his little blue barn, as do I.
Primping his feathers after his bath. Resting in his little barn. This hub is a personal story of adoption. Like most zoos around the country, the San Francisco zoo has adoption packages for individuals who want to contribute to the care and well being of their favorite animals at the zoo. The animals are put up for adoption as a species. So, in other words, if you wanted to adopt a tiger for example, your contribution would go towards the tigers as a whole. Now I have been going to the zoo for over five decades. Yes, I'm giving away my age with that statement but I love our zoo and still go there on a regular basis. The San Francisco Zoo has gone through many changes and many a media story over the past few years but for me, it brings me peace and joy each time I visit. I love all animals and the zoo brings me closer to their world. 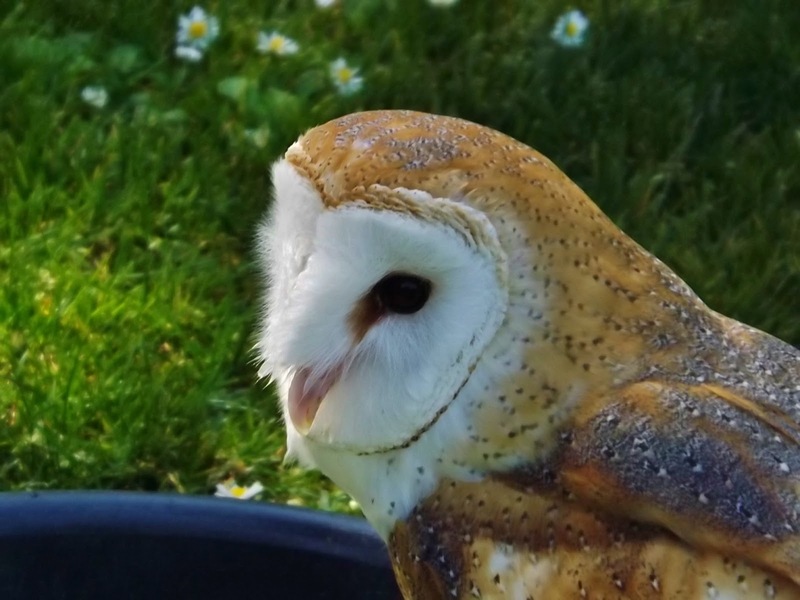 This is Wilbur the barn owl. He was born in 2006 and contracted West Nile Virus and as a result has neurological damage. Due to this damage he cannot be released into the wild. 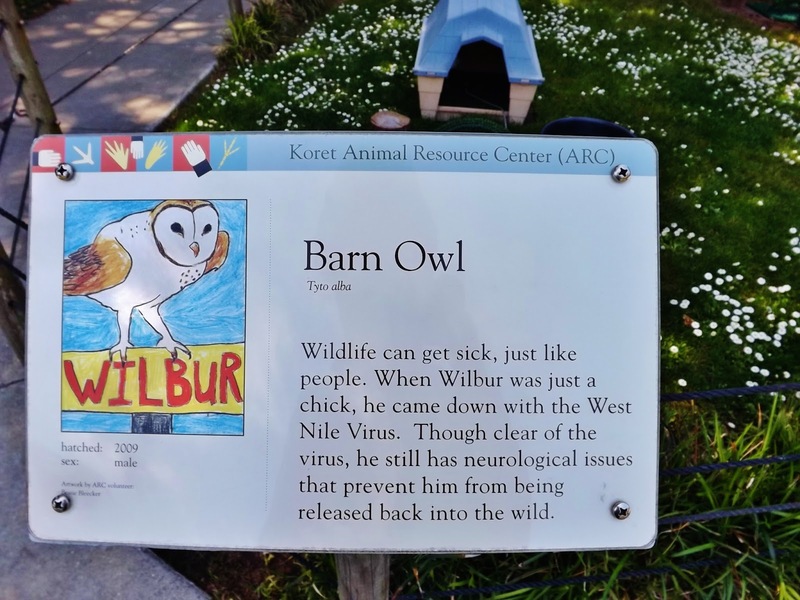 The zoo keeps him in the Koret Animal Resource Center where they take special care to make sure he has everything he needs. 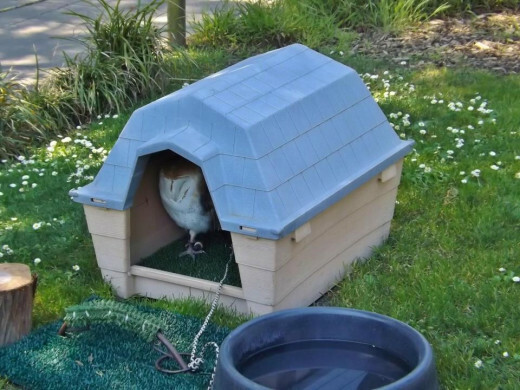 He has his own little blue barn in which he sleeps and rests. Since the zoo is only open during the day, I have only seen him while he is asleep. Barn owls in general have excellent hearing and as a result do not need their eyes to hunt at night. 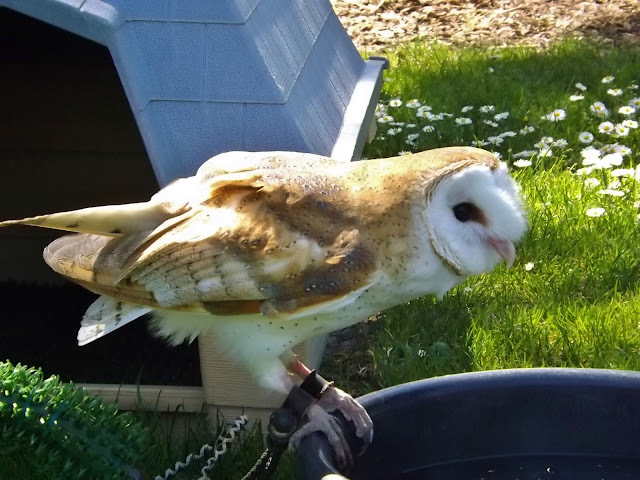 These owls usually feed on rodents and are active after dusk especially while in wooded areas. They can be anywhere from 8 to almost 20 inches in length and have a wingspan up to over 40 inches. They are nocturnal. 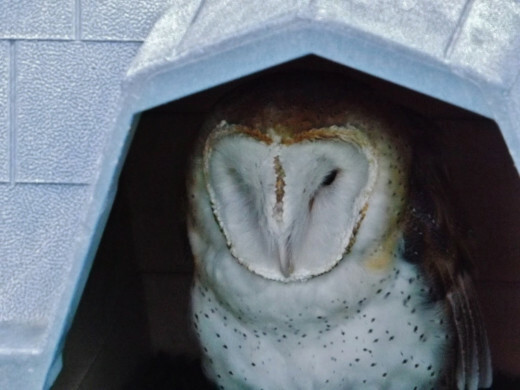 Source: Photo of Wilbur the barn owl taken at the San Francisco Zoo. My new son, Wilbur the barn owl. 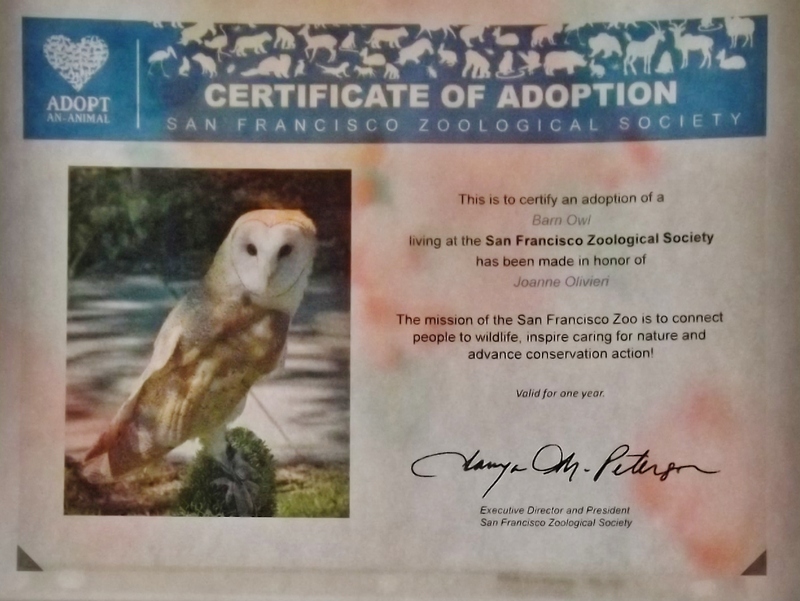 As i previously mentioned, the SF zoo offers adoptions for an entire species. When I first saw Wilbur in 2010 and read his story, he had my heart. I just fell in love with this little guy. I visit and talk to him each time I go to the zoo. 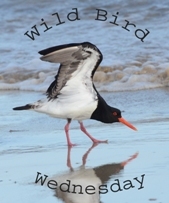 Visit Outdoor Wednesday for more great outdoor photography. That beak and those claws prove he's no fluffy pushover. But you're right, he's as cute as can be. I love the barn owls, they are so cute. Great post and I enjoyed the photos. What a great idea to connect wildlife and people by adoption! Wilbur has the most enchanting face! And love his feathers all fluffed out! A beautiful owl! I've never seen one except in photos. Absolutely AMAZING!! I've seen only one in my lifetime...decades ago, when I was just a youngster. At that time, it scared me with those huge eyes following ever step I took in my grandparent's barn. Now, I'd love to see one. I really enjoyed this post!! And love the adoption concept. 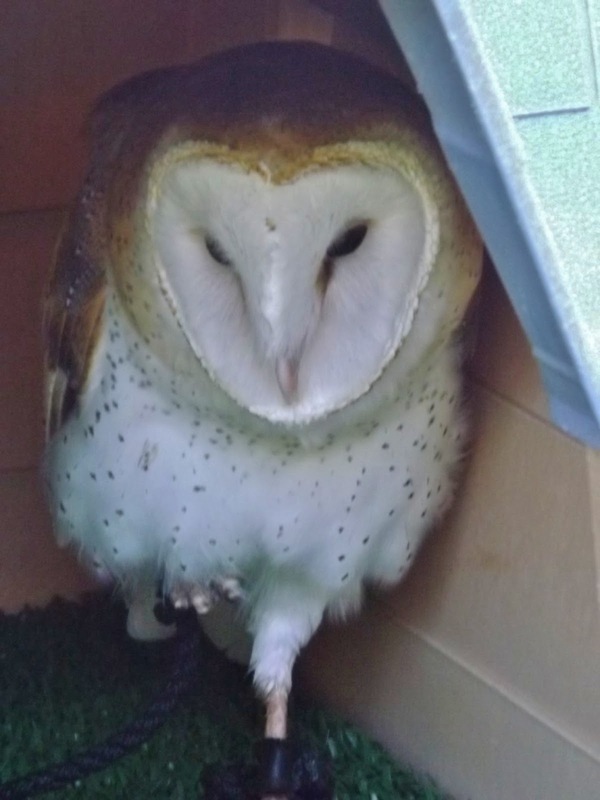 Interesting post about this little barn owl. I find owls fascinating and know what you mean about being excited he was active! For the first time I actually heard the eagle at our zoo make some noise and walk around on the ground instead of staying up on the tree just looking around. We went to the Cleveland zoo yesterday. what a beauty! glad he is being well cared for! Such a handsome owl! I've never seen one of these in the wild. Glad he's getting good care. Great that they allow adoption of the animals. How cool! Congrats on the adoption! He is a beautiful owl and so are these photos. Have a wonderful day. It may not be wild, but it is one of my favourite birds. I think its one of (if not the) most wide spread bird know. 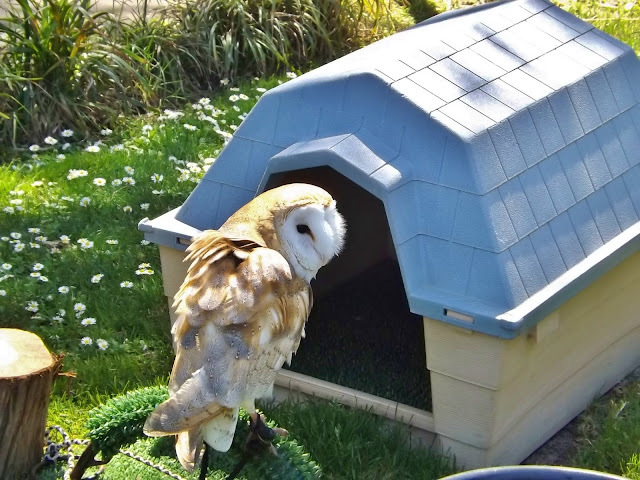 Barn Owls are found everywhere except Antarctica! 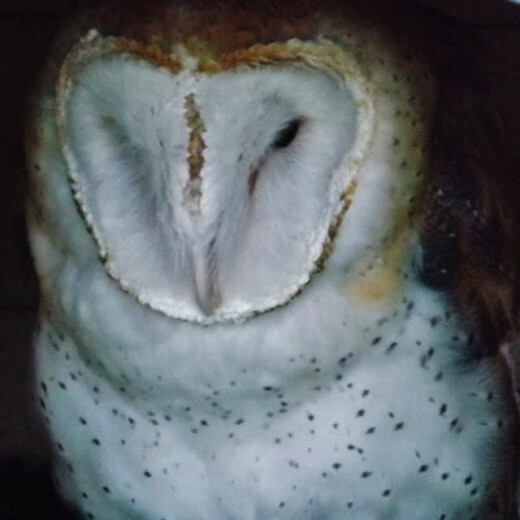 Wilbur is beautiful if you can say that about a male owl. :) I have an annual membership too and should go back soon to see him and the tiger cub. Absolutely stunning!!!! I love owls. How beautiful he is. I am a great fan of owls but seldom see them here. Thank you all so much for your comments. It is very much appreciated. I am learning more and more not just about Wilbur but about our zoo as well each time I visit.